Does anyone else get stage-fright when it's their turn in line at a coffee shop? As soon as I'm up, I can't remember the name or size of the drink I wanted, even though I had it all rehearsed as I was waiting. There is always a pregnant pause when I'm asked for my order, and I always end up saying something stupid by using ambiguous adjectives like 'medium', and 'cappuccino'. What makes it even worse is knowing that I used to work in a coffee shop. I'm guessing it's empathy pains, or karma. My default drink is a coconut latte. It's easy enough to blurt out, and once we're passed the size fiasco, I'm quite content in inhaling it. It's so good in fact, that every time I have one, I crave coconut cupcakes (for me, everything eventually comes back to food.) And yes, despite the fact that everyone I know is insane for not liking coconut, I still made these without the guilt of knowing that I'd more than likely have to eat them all myself...this lasted through the first bite. Unless I wanted to undo years of pilates and numerous embarrassing yoga poses, they had to be shared. Even the haters ended up loving these! They're moist, sweet (but not cloyingly so), and they're cupcakes. Who can look at a cupcake and not want to eat it? If you run into someone who absolutely cannot stand coconut, they should be able to pick out the flakes without too much difficulty - as you point and laugh at them. Preheat the oven to 325 degrees F. Line muffin pans with cupcake liners (this recipe makes about 18-19 cupcakes.) Set the pans aside. In a large bowl, sift together the flour, baking powder, baking soda, and salt. Set aside. Reduce the speed to low and add the eggs, 1 at a time, beating well after each addition (be sure the scape down the sides of the bowl as needed.) Add the vanilla and almond extracts and mix well. In 3 parts, alternately add the dry ingredients and the buttermilk to the batter, beginning and ending with the dry. Mix until just combined. Fill each liner to just slightly below the top. Allow to cool in the pan for 15 minutes. Remove to a baking rack and cool completely before frosting. Frosting: In the bowl of an electric mixer fitted with the paddle attachment, on low speed, cream together the cream cheese, butter, and both extracts. Slowly, at about 1/2 cup at a time, add the confectioners' sugar and mix until smooth. Once all the sugar has been added, crank up the speed a bit and beat until well combined. 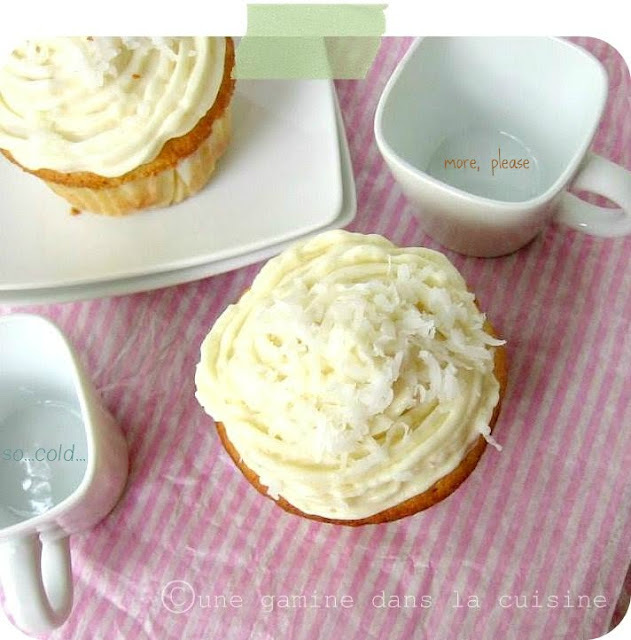 If you want, you may add the rest of the coconut directly into the frosting, or just sprinkle it on top. It's a win-win either way. Frost the cupcakes as desired! I would be happy to help you eat these. It's a sacrifice I'm willing to make. Please just send me all your coconut goodies rather than waste them on people who are going to pick it out! 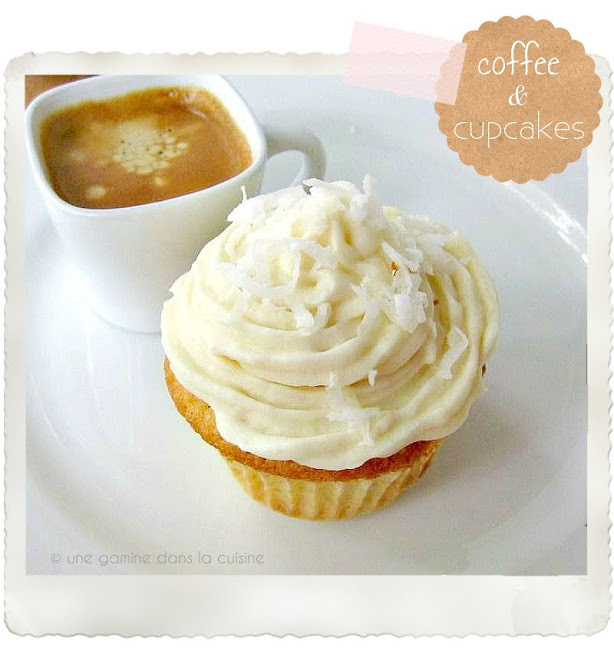 Those cupcakes look scrumptious, but I've never even heard of a coconut latte. I must find/make one! Mmmhhh, those look delicious! A great flavor. I am TOTALLY the same in coffee shops! My default however is a skinny vanilla latte, i dont think they do coconut lattes here otherwise im pretty sure that that would be my default also!! Coconut=best thing ever, so versatile, i just posted a gorgeous lemon coconut cake this morning but my coconut bug has not been satisfied yet so I am definitely saving these! :) how do you think it would be if you changed all/some of the buttermilk for coconut milk..? I get coffee shop stage fright but it's only restricted to Starbucks where they have stupid names for things. . .
"Umm... I'll have a large, I mean tall. No, no, is it grande? Yeah, grande Americano. I mean double. Oh! and make it decaf?" Hi! Using coconut milk instead of buttermilk is a great idea. You may want to add some lemon juice (maybe from half a lemon), just to give it that little acidic kick normally provided via buttermilk. coconut cupcakes are one of my favorite things, as is anything coconut. so i'm 100% with you. i would totally have helped you eat those. and my husband always gets stage fright when he's at coffee shops. or movie theaters. or restaurants. i tease him because that's my wifely duty. Thanks for the twitter follow. It gave me the chance to find your wonderful blog. I am going to enjoy sifting through all these back recipes. I keep coming back to this post and drooling. Oh man. I hope you give Ina another try.